First, Patrick has NEVER blocked a punt before in all of his years playing football! 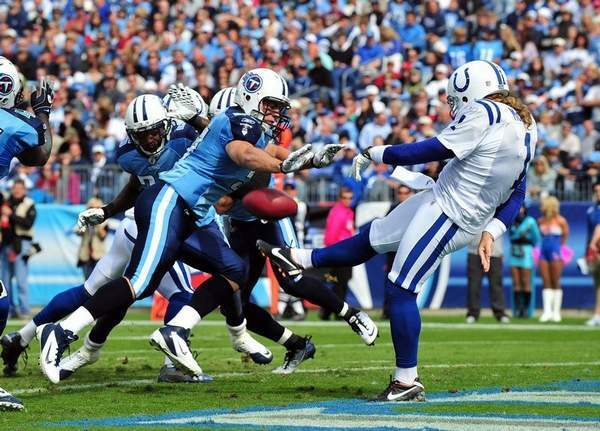 Patrick explained to me how difficult it is to block a punt, so the fact that the Titans have two blocked punts this year is pretty spectacular! 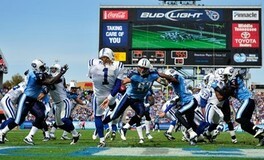 The first one was by Patrick’s good friend, Tim Shaw, when the Titans played in Pittsburgh. Here’s another view that someone posted on youtube.com…I love the description…”Patrick Bailey blocks a punt but someone else gets the the TD. Oh, well.” LOL! NFL.com kicked off their “Top Plays of October” video with the play…pretty exciting! There were also a few newspaper articles we found. The first is from the Tennessean. USA Today also posted a picture in the newspaper which was super exciting! Below is the photo they posted in color! One of the above articles mentioned Patrick’s battle wound – lol. Nearly two weeks later, he still has a mark on his arm from where he came down on the ball…although it is getting better. Here’s a picture from day one…this one is mild compared to what it turned into. Aside from the blocked punt, Patrick had three tackles on Special Teams – so needless to say, this was Patrick’s biggest game of his career thus far! I’m so proud of him, each and every week, whether he has a great game or a not so great game. It’s so exciting to watch him out there doing what he loves to do. Sometimes I pinch myself, thinking “Is that really my husband out there?! Is this really our life? !﻿” We are tremendously blessed and I thank God for all the gifts in our life each and every day. What amazed me most about my husband that week was the fact that he is so humble. To Patrick, that game and those plays were him just doing his job. Yes, he was excited and he knows it was a big game for him, but it’s just business as usual. He knows one play isn’t going to secure his job on the team this week or next year, so he’s constantly trying to get better. I love his drive and work ethic! 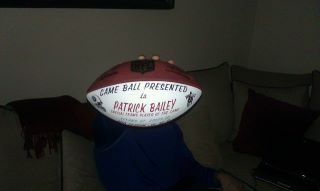 The Titans give out a game ball for Offense, Defense and Special Teams each week they get a win…Patrick was awarded his second ball of this season…yay! What a special memoir for such a special play!